We truly hope you will enjoy this visit and will not hesitate to send your gift baskets overseas with GiftsForEurope! Who is GiftsForEurope and where overseas are you located? Why should I Use GiftsForEurope? What about overseas shipping? And how are the gifts delivered in Europe? What corporate services do you offer? Who is GiftsForEurope and where are you located? 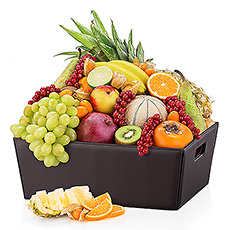 GiftsForEurope beginnings date back to 1998 when we started creating gift and fruit baskets for local customers in our family's fruit store in Roeselare, Belgium. We are located close to the french border, and less then 100 miles away from the UK, the Netherlands and Germany.. As a result today GiftsForEurope specializes in the delivery of gift baskets, gifts and flowers throughout Europe. 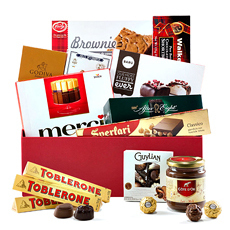 We also offer deliveries to Non-EU destinations such as Japan, Australia, and the USA of unique gifts such as Belgian chocolates that are difficult or impossible to find locally. In short: our GiftsForEurope team of 32 full-time and 15 part-time employees are here to help you with any overseas gift basket challenge you may have. Our USA headquarters are located in Chapel Hill, NC. We also have a customer service office in the USA in Portland, Oregon and an office in Lille, France. Top brands, high quality products at competitive prices. A wide range of gifts, gift baskets, flowers to meet everybody's budget and style. Some of the brands that we carry include Neuhaus, Godiva, Valrhona, Walkers, Jules Destrooper, Laroche Wines, Baron de Rothschild wines, Catena, Champagne Veuve Clicquot and Dom Perignon. These top fine food brands are combined with, wrapped in, most of them produced in Europe and designed by top designers. You will be able to explore the elegant and classic lines of Belgium's Royal Boch ceramics, add fun, environmentally friendly items from Germany's Koziol line, or top Scandinavian design from Denmark's Menu line. The entire GiftsForEurope staff in Europe and the United States is committed to bringing you the finest products and superior customer service. With GiftsForEurope what you see on our website is what your recipient will receive. We pack your gift and create your flower arrangement after we receive your order. We do not use prepackaged gifts. All items are fresh and we can customize any gift to meet your requirements. We take pride in making certain that each item ordered is delivered in beautiful, perfect condition. That is why we use professional shipping companies such as UPS, TNT etc.. The volume of gifts we ship throughout Europe on a daily basis allows us to offer premium shipping services at a very low cost. See our Shipping Guidelines. Before you can start shopping, you first have to choose which COUNTRY you want to send your product to. Then you can choose the CURRENCY in which you want to view the prices (default is US$). The geographical location is important to calculate the exact shipping costs per area per gift. We also choose to do this because we pre-select the products deliverable in these countries, that are most appropriate for the region. It also allows us to inform you about the total price, including shipping and all gift taxes or duties (unless clearly indicated otherwise in the shopping cart). No surprises at the end! When you enter the online store you may browse through the various groups of products that we offer. When you click a picture or the name of a product in this list, you will get more details of your selection. At this level you can easily return to your list, pick another list or decide you like this product and 'order'. And, don't worry the order process is fully secure. See our detailed security information. Also when you added a gift to a shopping cart and you would like to send another person to a similar, or a different address (even in a different country!) you 'add another gift' to the shopping cart and let the shop guide you on 'how to order these multiple gifts' during one shopping process only. Of course, never hesitate to ask a question when you have doubts. 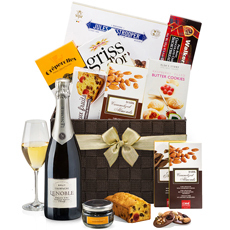 Companies with large lists - please visit our international corporate gift delivery section. As mentioned before we show you the shipping cost with the gift, no surprises at the end of gift selection. Our warehouses, one specialized in gifts, the other in flowers, are located less than 1 hour away from the main hubs of FedEx, UPS and TNT in Europe, which allows us to offer extremely competitive international shipping rates with reliable service. We offer competitive express and standard shipping rates for all European countries, and destinations around the world. Standard shipping rate may not appear when the gift is small because our express rates are often cheaper because of the volumes we handle. 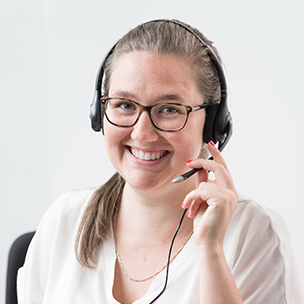 Our multi-lingual staff reviews your addresses, ensuring they are complete, accurate, and read like a local would write them. We offer a gift delivery service throughout Europe and to many countries outside Europe. Mondays through Fridays mainly. In France and Belgium we also deliver on Saturdays. Our gift client center allows you to track every step of your gift's progress from order through delivery and to print out an online invoice (receipt) 24 hours a day. We can take care of the order entry for you. Email us or give us a call to learn more about how we can help you. Don't forget to Bookmark us, and to go shopping please click here to select the delivery destination of your gift. Best Regards Nathalie Sintobin & The GiftsForEurope Team.